Depeche Mode - Speak & Spell - Sire SRK 3642. 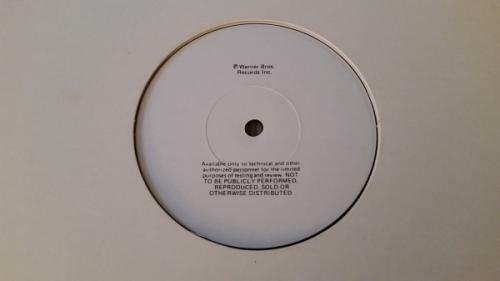 This is a test pressing of the debut album by Depeche Mode. Has white Warner Bros labels with the "testing and review" text on bottom. Matrix #'s are SRK 1 3642-RE1-LW1 / SRK 2 3642-RE1-LW2. Vinyl is in EX to NM condition with almost no signs of previous play. No writing on labels. Generic white die-cut cover. Please see my other auctions including Depeche Mode Promo, Marianne Faithful Test Pressing and New Order Sealed vinyl! Please contact me directly with any questions or concerns. Will ship in a standard record mailer with an extra layer of cardboard for protection. Near Mint [NM or M-]: A nearly perfect record. Many dealers won't give a grade higher than this implying (perhaps correctly) that no record is ever truly perfect. The record shows no obvious sign of wear. A 45 rpm sleeve has no more than the most minor defects, such as almost invisible ring wear or other signs of slight handling. Very Good Plus [VG+]: Shows some signs that it was played and otherwise handled by a previous owner who took good care of it. Record surfaces may show some slight signs of wear and may have slight scuffs or very light scratches that don't affect one's listening experience. Slight warps that do not affect the sound are OK. Very Good [VG]: Many of the defects found in a VG+ record are more pronounced in a VG disc. Surface noise is evident upon playing, especially in soft passages and during the song's intro and fade, but will not overpower the music otherwise. Groove wear will start to be noticeable, as will light scratches deep enough to feel with a fingernail) that will affect the sound. A jacket or sleeve has seam splits, especially at the bottom or on the spine. Tape, writing, ring wear or other defects will start to overwhelm the object. If it's a common item, you'll probably find another copy in better shape eventually. Pass it up. But if it's something you have been seeking for years, and the price is right, get it.